The Iranian government has persuaded the director of the Bangkok International Film Festival to withdraw Persepolis from its programme. The film, based on a autobiographical graphic novel by Marjane Satrapi, tells the story of her childhood in post-revolutionary Iran. When it was shown at Cannes, it drew complaints from the Iranian government who claimed it was “Islamophobic”. I was invited by the Iranian embassy to discuss the matter and we both came to mutual agreement that it would be beneficial to both countries if the film was not shown. There is also a particularly witless contribution from serial letter-writer Dr Munjed Farid Al Qutob who thinks Rushdie shouldn’t have got a knighthood because he “did not contribute any constructive work to interfaith dialogue” – as if that’s a requirement for receiving an honour. The Telegraph reports that the German government has refused permission to film at military sites because the star is Tom Cruise – a leading Scientologist. The film is based on a true story about a plot to kill Adolf Hitler. 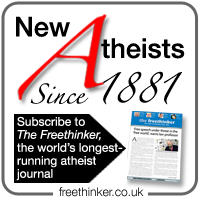 The German government is correct refusing to give Scientology special status as a religion. But it is hard to see how blocking this film will do anything except allow the CoS an opportunity to play the victim card. UPDATE: (July 4) They’ve banned him again. This time from filming outside a police station. This is getting embarrassing. According to Reuters 10 people connected with The Da Vinci code, including author Dan Brown and Director Ron Howard, are being investigated by state prosecutors in Italy. Apparently the film contravenes article 528 of Italy’s penal code. A group of unnamed clerics from the town of Civitavecchia filed the a complaint. UPDATE: (June 27) The case has been dropped. The insult of the English Queen for honouring a knighthood on Salman Rushdie has sent the clear message that from the point of view of England and its Queen, Rushdie’s act is a great and praiseworthy service to the slowly vanishing English Empire which needs to be acknowledged. This act can be seen as a cover-up to distract the public’s attention from the sexual scandals of royal princes and princesses who are infamous and detested even among the English population, a population who cannot wait for the end of this hated monarch regime which stinks of the Middle Ages. Funny to hear Islamists mentioning the Middle Ages pejoratively, especially since that is the era to which they want the world to return. A group of Islamabad traders upped the bounty on Rushdie by offering around £82,000 to anyone who beheads him, and the Pakistan government renewed calls to withdraw the honour. This time they are claiming that the award breaks UN resolution 1624 which call on members to “enhance dialogue and broaden understanding” as a means to preventing “the indiscriminate targeting of religions and cultures”. Once again: it’s all about us. 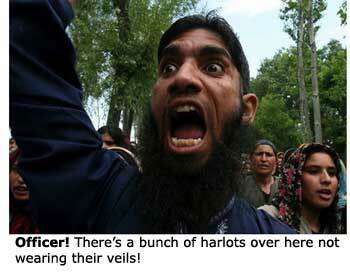 Here in the UK there were demonstrations outside the Regents Park mosque, led by Anjem Choudary. Protesters attacked photographers and burned flags, photographs etc. 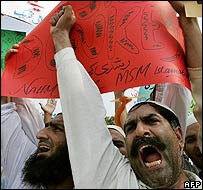 Placards read “god curse the queen”, and one leader explained that Rushdie deserved to be attacked. The idiot Lord Ahmed continued to dig himself into a hole from which it is unlikely he will ever emerge. Muslims can only see this action as an attempt to create deep offence to Muslims and divert their attention from contributing to community cohesion in these challenging times. So it was a breath of fresh air to see the Sunday papers speaking up for reason and sanity. Nick Cohen, and Andrew Anthony gave robust defences in The Observer, and in The Telegraph Jenny McCartney reminded the ragers that anger is a choice. As the audience applause for Williams demonstrated, this is a remarkably common assumption – that the most “fair” and “even-handed” position is halfway between homicidal thuggery and calm argument, or halfway between intellectual freedom and a visceral fear of speaking. Any other position is, supposedly, unreasonable or “extreme”. Absolutely. We cannot give an inch to these murderously puerile thugs – because there isn’t an inch to give. The sinister and cultish Church of Scientology has reacted angrily to news of a spoof musical which will debut at the Edinburgh Fringe this year. Xenu is loose! (subtitle: “Cower puny Humans as the Dark Prince of the Galactic Federation rains Atomic Death once more upon your Pitiful Planet — The Musical!”) is a spoof of L Ron Hubbard’s piss-poor Battlefield Earth. It was created by an Oxford-based drama group who spent a year collecting material about the crackpot pay-as-you-go religion. The more we looked into it, the more we saw potential for an exposé show. Instead of putting together a straight satire we decided to create a kitsch rock’n’roll musical based on the science-fiction mythology on which Scientology is based. We hope to open people’s eyes about Scientology and the sophisticated and complex psychological techniques it uses to recruit people and keep them within the organisation. In our opinion it is a cult. Scientology spokeswoman Janet Kenyon advised people to stay away from the show, and said that the church was considering “action”. L Ron Hubbard was also a science fiction writer. It is a cheap parlour trick to try to liken the philosophy of Scientology to that work. There is nothing in the theology or philosophy of Scientology about belief in aliens. According to Scientological mythology, Xenu was an alien overlord who brought billions of aliens to Earth in jet planes, stacked them around volcanoes, and blew them up with H-bombs. Their souls then clustered together and attached themselves to the bodies of living humans, thus causing them to have skeptical attitudes towards loopy, money-grabbing science-fiction-based cults. In a hilarious display of infantilism, a leading group of Pakistani Islamic “scholars” has awarded its highest honour to Osama bin Laden. 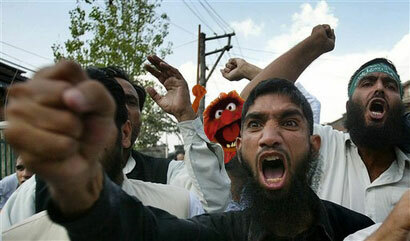 Will there be rioting and burning of bin Laden effigies in London as a result? Or will everyone be too busy laughing at this delightful display of childishness? 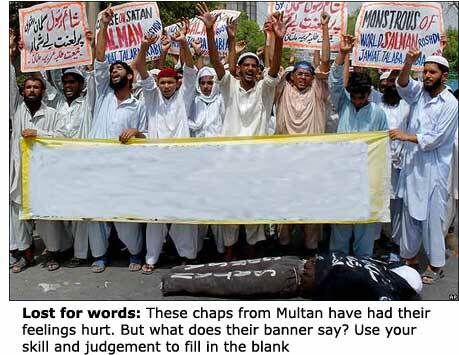 Way to command respect, Pakistani imams! Margaret Beckett, however, said sorry. Obviously, we are sorry if there are people who have taken very much to heart this honour, which is after all for a lifelong body of literary work. Inayat Bunglawala, and Assistant Secretary-General of the MCB, writes “in a personal capacity” in this comment piece in The Guardian. So, unfortunately, his words cannot be taken as the official MCB line. Looking back now on those events I will readily acknowledge that we were wrong to have called for the book to be banned. Today I can certainly better appreciate the concerns and fear generated by the images of book-burning in Bradford and the calls for the author to be killed. Our detractors had been right. The freedom to offend is a necessary freedom. Credit where it’s due. This comment piece marks a significant step in the right direction from a leading member of the MCB. UPDATE: (21 June) Several people whose opinions I respect think I may be giving Bunglawala too much credit. Here’s one. Suggestions in the comments box. The winner will be showered in glory. A squirt of glory will be directed at the runner up. Judge’s decision is final. RESULTS: Before this story disappears off the bottom of the page, here are the results of the banner competition. It was a close-run thing, as the standard of entries was extremely consistent. A shower and a squirt of glory goes to those two, respectively.